It’s been some exciting 10 days, filled with some of the most amazing games of the year and at the end of it all, we’re left with a champion team that can call itself the best in the world. To complete a full circle, the grand finals were played between Canada and USA, a sort of a deja vu, since both teams’ first match of the championship was against each other. With the football world cup over, we can now fully concentrate on our very own world lacrosse championship that is happening these days in Denver. This much-awaited event started four days ago, on the 11th of July, and has been filled with great games and interesting scores! Good news is here! 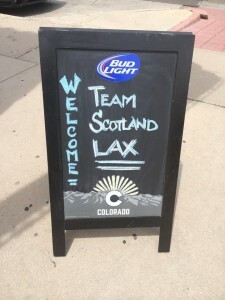 Mr. Nye Gordon from Team Scotland Lacrosse is alive and well and in Denver already! He got in contact with us for a last quick update before the games and start and also has some pretty cool pictures too! Team Scotland arrived at various points throughout Friday the 4th. So we have arrived. Team Scotland arrived at various points throughout Friday the 4th. Saturday was spent doing all the things we normally do at the start of the tournament, the opening ceremony to welcome the squad to the tournament and getting all of our gear (some very nice new kit, Nike, Under Armour and a sweet new Cascade R helmet). With just a couple weeks before the World Lacrosse Championships opening ceremony on the 10th of July, Wales has released a video that allows us to take an insider’s look at their training process and excitement so close to the main event of the year. It does make you feel excited with and for them and we can’t wait for the games to finally start. We’re pretty sure they’d agree with us as well. Videos like this one are always enjoyable, as it brings players and fans closer together and allow a more intimate relationship between the two, also providing a great source of inspiration and motivation regardless of what anyone does. Enjoy and tell us what you think of the video in the comments below! Sticks up!